Austrian Interior Minister Johanna Mikl-Leitner has warned that force may be necessary to ease a backlog of refugees if Germany decides to no longer let them enter via its border with Austria. 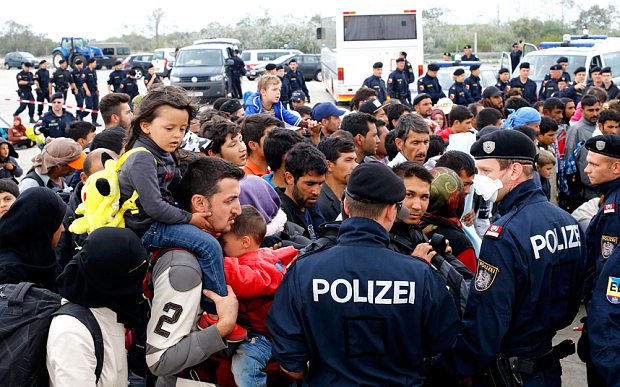 However, the government has said it will continue to work closely with Germany to speed up the flow of refugees. Germany has re-imposed border controls and stopped some train services from Austria in an effort to slow the influx of refugees. Austria has been letting refugees enter the country via its border with Hungary – and allowing them to travel on towards Germany. Asked at a press conference on Tuesday what would happen if Germany “seals the border”, Mikl-Leitner replied: “Then there will be a massive backlog here in Austria and therefore we quickly need a European answer. Hundreds of refugees are gathering at a crossing near the Austrian city of Salzburg each day, planning to cross into Germany. Austrian Chancellor Werner Faymann warned against the use of expressions such as “sealing the border”. He said German controls were in place, and Austria would have to find ways to deal with the build-up of refugees waiting to reach Germany – by taking in any that request asylum in Austria. “The impression must not arise in Germany that the Austrians are doing the same thing as the Hungarians, simply moving people on,” Faymann told reporters, referring to the Budapest government’s policy of shunting tens of thousands of refugees to its frontier with Austria. Of the more than 167,000 refugees who have reached Austria since early September, more than 90 percent travelled on to Germany, Faymann said.